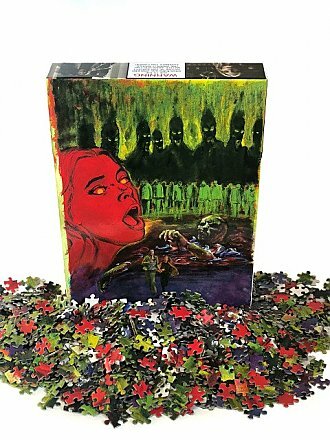 A jigsaw puzzle that will gouge your eyes out. The dreaded gateways to Hell are concealed in these 1000 cursed pieces. A couple of nights struggling with this one will make you feel paralyzed, watching flesh-eating tarantulas come to rip out your tongue. Officially Licensed. Art by Jerry Martinez commissioned for the 1998 theatrical release by Grindhouse Releasing.